We don’t always eat simply to satisfy hunger. We also turn to food for comfort, stress relief, or as a reward. Unfortunately, emotional eating doesn’t fix emotional problems. It usually makes you feel worse. Afterward, not only does the original emotional issue remain, but you also feel guilty for overeating. Learning to recognise your emotional eating triggers is the first step to breaking free from food cravings and compulsive overeating, and changing the habits that have sabotaged your diets in the past. If you’ve ever dived into a tub of ice cream when you’re feeling down, you’ve experienced emotional eating. Emotional eating is using food to make yourself feel better—eating to fill emotional needs, rather than to fill your stomach. Using food from time to time as a pick me up, a reward, or to celebrate isn’t necessarily a bad thing. But when eating is your primary emotional coping mechanism—when your first impulse is to open the fridge whenever you’re upset, angry, lonely, stressed, exhausted, or bored—you get stuck in an unhealthy cycle where the real feeling or problem is never addressed. ▪ Do you eat more when you’re feeling stressed? ▪ Do you eat when you’re not hungry or when you’re full? ▪ Do you eat to feel better (to calm and soothe yourself when you’re sad, mad, bored, anxious, etc.)? ▪ Do you reward yourself with food? ▪ Do you regularly eat until you’ve stuffed yourself? ▪ Does food make you feel safe? Do you feel like food is a friend? ▪ Do you feel powerless or out of control around food? ▪ Emotional hunger comes on suddenly. It hits you in an instant and feels overwhelming and urgent. Physical hunger, on the other hand, comes on more gradually. The urge to eat doesn’t feel as dire or demand instant satisfaction (unless you haven’t eaten for a very long time). ▪ Emotional hunger craves specific comfort foods. When you’re physically hungry, almost anything sounds good—including healthy stuff like vegetables. But emotional hunger craves fatty foods or sugary snacks that provide an instant rush. You feel like you need chocolate or pizza, and nothing else will do. ▪ Emotional hunger often leads to mindless eating. Before you know it, you’ve eaten a whole bag of chips or an entire tub of ice cream without really paying attention or fully enjoying it. When you’re eating in response to physical hunger, you’re typically more aware of what you’re doing. ▪ Emotional hunger isn’t satisfied once you’re full. You keep wanting more and more, often eating until you’re uncomfortably stuffed. Physical hunger, on the other hand, doesn’t need to be stuffed. You feel satisfied when your stomach is full. ▪ Emotional hunger isn’t located in the stomach. Rather than a growling belly or a pang in your stomach, you feel your hunger as a craving you can’t get out of your head. You’re focused on specific textures, tastes, and smells. ▪ Emotional hunger often leads to regret, guilt, or shame. When you eat to satisfy physical hunger, you’re unlikely to feel guilty or ashamed because you’re simply giving your body what it needs. If you feel guilty after you eat, it’s likely because you know deep down that you’re not eating for nutritional reasons. 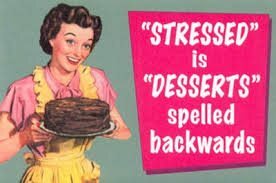 ▪ Stress – Ever notice how stress makes you hungry? It’s not just in your mind. When stress is chronic, as it so often is in our chaotic, fast-paced world, it leads to high levels of the stress hormone, cortisol. Cortisol triggers cravings for salty, sweet, and high-fat foods—foods that give you a burst of energy and pleasure. The more uncontrolled stress in your life, the more likely you are to turn to food for emotional relief. ▪ Stuffing Emotions – Eating can be a way to temporarily silence or “stuff down” uncomfortable emotions, including anger, fear, sadness, anxiety, loneliness, resentment, and shame. While you’re numbing yourself with food, you can avoid the emotions you’d rather not feel. ▪ Boredom or Feelings of Emptiness. Do you ever eat simply to give yourself something to do, to relieve boredom, or as a way to fill a void in your life? You feel unfulfilled and empty, and food is a way to occupy your mouth and your time. In the moment, it fills you up and distracts you from underlying feelings of purposelessness and dissatisfaction with your life. ▪ Childhood habits – Think back to your childhood memories of food. Did your parents reward good behavior with sweets, take you out for McDonalds when you got a good school report, or give you chocolate when you were feeling sad? These emotionally based childhood eating habits often carry over into adulthood. Or perhaps some of your eating is driven by nostalgia—for cherished memories of baking and eating cookies with your mum, or gathering around the table with your extended family for a home-cooked dinner. ▪ Social influences – Getting together with other people for a meal is a great way to relieve stress, but it can also lead to overeating. It’s easy to overindulge simply because the food is there or because everyone else is eating. You may also overeat in social situations out of nervousness. Or perhaps your family or circle of friends encourages you to overeat, and it’s easier to go along with the group. You probably recognised yourself in at least a few of the previous descriptions. But even so, you’ll want to get even more specific. One of the best ways to identify the patterns behind your emotional eating is to keep track with a food diary. Every time you overeat or feel compelled to reach for your version of comfort food Kryptonite, take a moment to figure out what triggered the urge. If you backtrack, you’ll usually find an upsetting event that kicked off the emotional eating cycle. Enter it in to your food and exercise diary: what you ate (or wanted to eat), what happened to upset you, how you felt before you ate, what you felt as you were eating, and how you felt afterward. You can use the food trigger section to select the food and which emotion set it off but also use the notes section on the right side of the diary page to describe how you are feeling. Over time, you’ll see a pattern emerge. Maybe you always end up gorging yourself after spending time with a certain friend. Or perhaps you stress-eat whenever you’re on a deadline or when you attend family functions. Once you identify your emotional eating triggers, the next step is identifying healthier ways to feed your feelings. ▪ If you’re depressed or lonely, call someone who always makes you feel better, watch a favourite movie or look at a favourite photo or cherished memento. ▪ If you’re anxious, expend your nervous energy by dancing or singing to your favourite song, or taking a brisk walk. ▪ If you’re exhausted, treat yourself with a hot cup of tea, take a bath, light some scented candles, take some “me” time in form of relaxation rather than in food! ▪ If you’re bored, read a good book, watch a comedy show, explore the outdoors, or turn to an activity you enjoy. Most emotional eaters feel powerless over their food cravings. When the urge to eat hits, it’s all you can think about. You feel an almost unbearable tension that demands to be fed, right now! Because you’ve tried to resist in the past and failed, you believe that your willpower just isn’t up to it. But the truth is that you have more power over your cravings than you think. As mentioned earlier, emotional eating tends to be automatic and virtually mindless. Before you even realise what you’re doing, you’ve reached for a tub of ice cream and polished off half of it or eaten a pack of 4 Crunchies. But if you can take a moment to pause and reflect when you’re hit with a craving, you give yourself the opportunity to make a different decision. You have the right to make the final choice. All you have to do is put off eating for five minutes, or if five minutes seems unmanageable, start with one minute. Don’t tell yourself you can’t give in to the craving; remember, the forbidden is extremely tempting. Just tell yourself to wait. While you’re waiting, check in with me, or post of the Facebook group, anything to take your mind away. How are you feeling? What’s going on emotionally? Even if you end up eating, you’ll have a better understanding of why you did it. This can help you set yourself up for a different response next time. Just keep tracking it in your diary. Even if you decide not to eat, use the notes section to type in how you are feeling and at what time etc. Allowing yourself to feel uncomfortable emotionally can be scary. You may fear that, like Pandora’s box, once you open the door you won’t be able to shut it. But the truth is that when we don’t obsess over or suppress our emotions, even the most painful and difficult feelings subside relatively quickly and lose their power to control our attention. To do this you need to become mindful and learn how to stay connected to your moment-to-moment emotional experience. This can enable you to rein in stress and repair emotional problems that often trigger emotional eating. When you’re physically strong, relaxed, and well rested, you’re better able to handle the curveballs that life inevitably throws your way. But when you’re already exhausted and overwhelmed, any little hiccup has the potential to send you off the rails and straight toward the fridge or in my case the local garage! Exercise, sleep, and other healthy lifestyle habits will help you get through difficult times without emotional eating. ▪ Make Daily Exercise a Priority. Physical activity does wonders for your mood and your energy levels, and it’s also a powerful stress reducer. It’s the reason why I put a lot of emphasis on exercise as part of my Why Weight Ireland plan and making it become part of your daily routine. ▪ Aim for a Good Night Sleep Every Night. When you don’t get the sleep you need, your body craves sugary foods that will give you a quick energy boost. Getting plenty of rest will help with appetite control and reduce food cravings. ▪ Make Time For Relaxation. Give yourself permission to take at least 30 minutes every day to relax, decompress, and unwind. It’s important to plan some YOU time. This is your time to take a break from your responsibilities and recharge your batteries. ▪ Connect With Others. Don’t underestimate the importance of close relationships and social activities. Spending time with positive people who enhance your life will help protect you from the negative effects of stress. I am not a nutritionist or therapist so all my comments and statements on any of my blogs are my own and are based on my own life experiences and on research completed. As someone who has lost almost eight stone, a fitness professional and owner of a weight loss & fitness business, I have a lot of knowledge and experience that I try and share with you and give you the opportunity to take the advise on board.